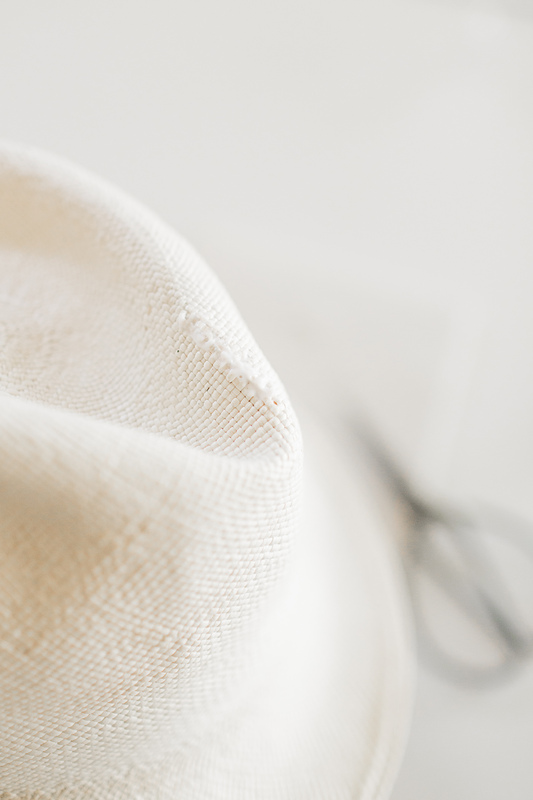 How to Repair a Straw Hat - Hej Doll | Simple modern living by Jessica Doll. Quite a few times I’ve mentioned my trusty Panama hat that I’ve had for years. I think I bought it in 2012. It managed to lose it’s band during my trip to Grand Cayman last year, but I still love the way it looks. Beyond that, the top has cracked from years of love and wear (see also: the pinch hat grab). I am not one to give up things I love easily, so I decided that I would repair it. 1. Cut your cloth to a size about 1/4 – 1/2″ larger than the spot you’d like to repair. 2. 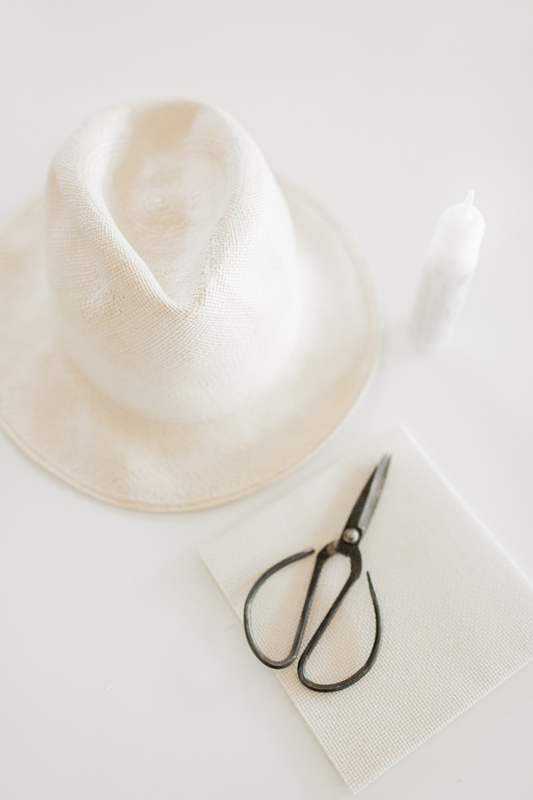 Apply glue to one side, then glue cloth on the inside of the hat, pressing at the seams and shaping until it is the right shape. 3. Hold in place until glue has a chance to dry a little. 4. 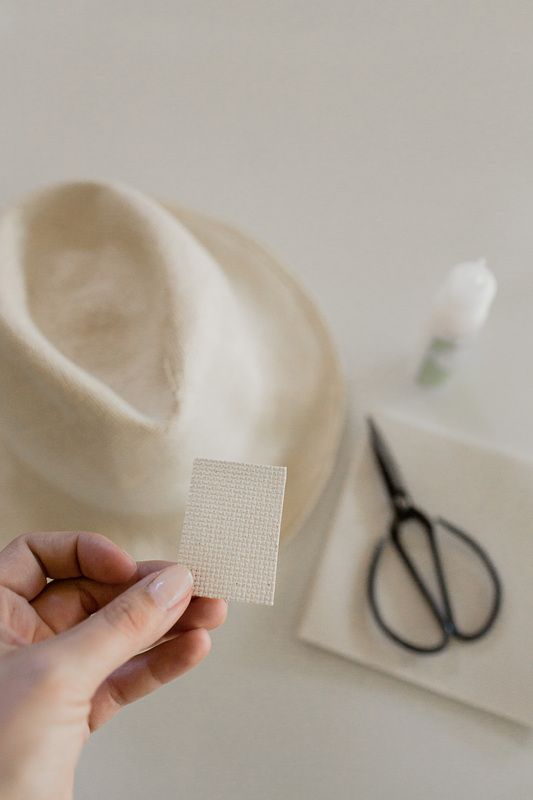 Fill in and reshape the top of the hat using the glue and your fingertips (I used the scissor point). 5. Allow to dry and enjoy your hat again! I have at least three hats I need to fix-thank you!! I had no idea you could even do this! What a simple way to repair it – it looks brand new! I bought a bunch of “bands” in Peru when we went-basically just local weaving. I replaced all my bands with colorful ones when I got back. Thank you so much for your tips. Didn’t know you could actually repair a straw hat with the materials you’ve suggested. Your hat looks like it never needed repairing. This makes me hopefully that my hat will looks the same. Thank you so much for all your tips. I’m definitely going try it on my Panama hat. This technique saved my very old, very well worn and much loved Panama hat. Thank you. What I found was that unless someone looked very closely or if I pointed out where I repaired the hat you would never notice it at all. The actual procedure seems simple, and it is but the patch I had to use was on the large side, so it would cover more than one worn out area. This meant holding a rather large patch with my fingers while the glue set but this particular does not set quickly, in fact It seems to take two days to set (to where its not tacky anymore) in my environment. After a minute of holding the patch down (my patch was around the most carved part of the crown, which is the most challenging spot to patch) the glue dod not how the patch down so the patch lifted up. I had to keep pressing down, waiting a minute then lift my fingers slowly (because the glue stuck to my fingers) to see if the glue held the patch down, each time it did not so I had to press the wet patch down again. This process took many minutes, so I pass this experience along so others know that it takes a bit pf patience, but in the end I wound up with a hat that looks good and the repair (surprisingly) is not noticeable despite having had rather large hole in it. I’m glad to hear your hat is saved! Sorry it was a little difficult for you. It’s hard to predict the nature of how this will turn out because every repair is different.